I used to never listen to a book twice but this time I kind of had to – I volunteered to be Question Maestro at 4_Mystery_Addicts and needed to refresh my memory. I remember the broad basics and that I enjoyed it but I read it in July! (See Norwegian by Night.) But to ask discussion-prompting questions review is needed. And I’m wow’ed by how much I missed – or how much more there is in the book than what I got. But I really should not be surprised. Quite often in good books a plot line will garner our attention on the first reading, while the underlying themes and ideas will be hidden for a second read. 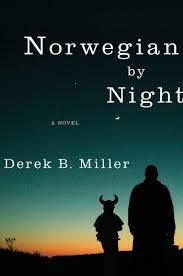 I do this fairly often – just not with crime books but crime books with literary themes have a very difficult time succeeding and I don’t think Norwegian by Night quite makes the cut. Sheldon is a survivor of many things – of the Holocaust, the Korean War, his son’s death, his wife’s death and his own retirement. Now he’s been transplanted to Oslo by his granddaughter and her husband. All this and his memory is going – or should I say his memory is coming back and leading him into the past more and more – away from the present. Sheldon’s mind is full of intertwined memories and visions and ghosts. So based on his confusion and his memories, after the woman who lives upstairs is shot while Sheldon and her son hide in the closet of Sheldon’s flat, he runs with the child. As they run and hide for the next four days memories and visions and ghosts haunt him. Still, he manages to evade the police as well as the gang who shot the boy’s mother. Enver, the father of the boy and killer of the boy’s mother, is also plagued by memories of war – the war in Kosovo. Is the structure indicative of Sheldon’s mind? Is it alternating and digressive for a reason? Or was Miller just not up to the job of writing this type of novel with memories and heavy plot action both. This is a debut novel and it shows. The frame story is a plot-based crime tale, but the back-stories take over preventing a good pace. I think Miller just tried to do too much in one book.